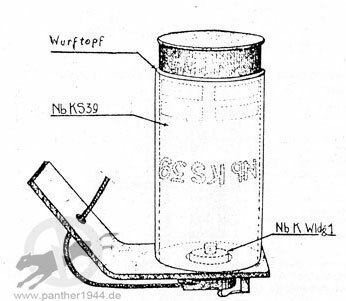 In 1938 a smoke grenade dropping device at the rear on AFV of the Wehrmacht was introduced. It was loaded with five Nebelkerzen S „Schnellnebelkerze“(rapid smoke grenade). Compared to the “normal” smoke grenade the Schnellnebelkerze was supposed to produce intransparent smoke screen as fast as possible to camouflage the own vehicle. In contrast the “normal” smoke greande was used to limit the enemy’s sight for a long period of time to do some engineer work like opening mine fields, e.g. in the cover from the smoke. The introduction of the “Nebelkerzenabwurfvorrichtung“ was carried out with the “Allgemeinen Heeresmitteilung“ (General Army Communication) of 7.9.1938. The disadvantage of this device was that it was installed at the rear of the vehicle and the smoke screen build up there! Hereby the of "Nebelkerzen-Wurfladung 1" was introduced. It serves to throw the Schnellnebelkerze from the smoke canisters attached to armored vehicles-throwing device. Here's a picture of "Nebelkerzen-Wurfladung 1" on a Panzer III. Note the offset arrangement. The central candle throwing device itself was not published until the Heerestechnischen Verordnungsblatt (Army Technical Regulation Gazette) on 01.05.1943. Text about this: "New produced Pz.Kpfw. and Pz.Kpfw. running through the home repair, will be equipped with Nebelkerzen-Wurfgerät with electric ignition. Installation by the troops is not intended. Out of the Nebelkerzen-Wurfgerät, the Schnellnebelkerze 39 with Wurfladung 1 and Zündladung N 4 can be fired." 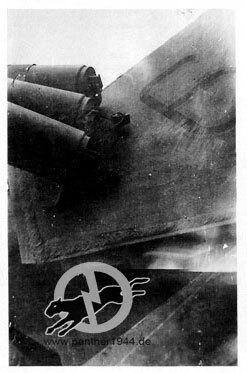 The "Schnellnebelkerze 39 (Nb K S 39)" was filled with zinc dust to produce the smoke an the fog should last for 100 to 200 seconds. 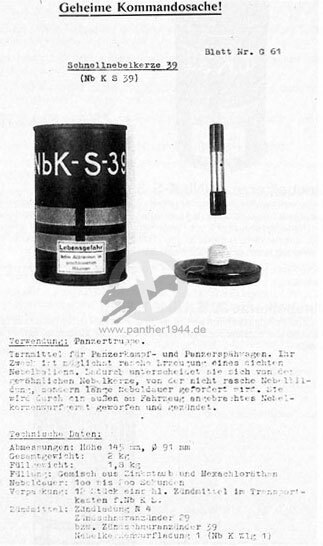 The also yet introduced "Schnellnebelkerze 39 B (Nb K S 39 B)" differed only by a modified mixture for smoke production and the additional letter B on the tin. In June 1943 the mounting of the "Nebelkerzen-Wurfgerät" was stopped. According to reports from the troops, self ignition of the smoke candles occurred when hit by small bore ammunition. The resulting fog took the sight of the crew accidentally.